One of the most attractive parts of purchasing silver from Anonymous Mint is variety. While the mint keeps its mintage figures low to ensure collectible value for the silver rounds its produces, the variety of programs and designs never ceases to amaze. The Lisa Parker Collection is the latest example of that work and it offers six different designs from the famed wildlife artist. Right now, 1 oz Proof Silver Lisa Parker Collection Moon Gazer Rounds are available to purchase online at Silver.com. Rounds ship to you inside of protective capsules and feature a Certificate of Authenticity! Third design issue in the Lisa Parker Collection! 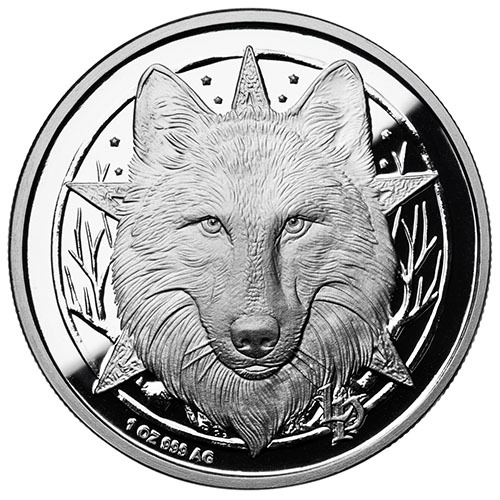 The image of Moon Gazer appears on the round’s obverse. The design of Wild One continues to feature on the round’s reverse. Selections in the series by Julie Lindquist. Each 1 oz Proof Silver Lisa Parker Collection Moon Gazer Round in this product listing at Silver.com comes with a protective plastic capsule to house the round and features a Certificate of Authenticity with purchase. The included COA has the unique serial number of your individual round printed on it. Additionally, these proof rounds offer a beautiful visual finish of frosted designs and mirrored background fields. The Lisa Parker Collection features a total of six designs in all for the series. For each individual design release, collectors have the option to choose between 1 oz silver and 5 oz silver rounds. Both weights include the option to purchase a proof, antique, or colorized proof round. 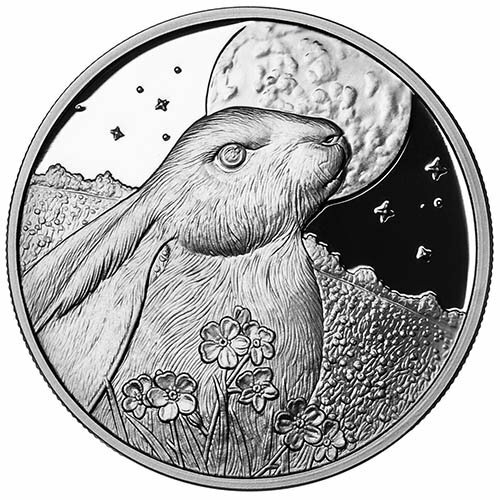 On the obverse of 1 oz Proof Silver Lisa Parker Collection Moon Gazer Rounds is the image of a rabbit in a field. It is known as Moon Gazer because it sits with its ears pinned back and head tilted toward the sky as it gazes up at the seemingly oversized moon above. The design field also includes flowers blooming in front of the rabbit, rolling hills in the background, and stars in the sky overhead. The reverse of Proof Silver Lisa Parker Collection Moon Gazer Rounds includes the common design theme for the series. This front-facing wolf’s head is known as Wild One and is among the most popular works of art Lisa Parker has created in her distinguished career. Lisa Parker began drawing wildlife and mystical works when she was very young. Her passion for wildlife and nature combine beautifully with her interest in mystical themes as she uses lighting and composition to draw the viewer into every design. Most of her works today are completed in watercolors, though she has used other mediums such as colored pencils and oils. If you have any questions, Silver.com customer service is waiting to help. You can reach out to us at 888-989-7223, chat with us live online, or simply email us.